For all wood types, steel, non-ferrous metals, precious metals, plastics (also plexiglass and glass fibre). Electronically regulated sanding speeds 250 - 800 m/min. Powerful drive and vibration-free running thanks to balanced DC motor. Housing in glass-fibre reinforced POLYAMIDE. Aluminium table, adjustable to 50° incline downwards, 10° upwards. With angle stop. 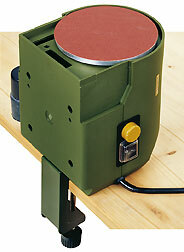 The squared sanding disc has a glued-on silicon film. This surface ensures that self-adhesive sanding discs can be removed without problems after use. Two additional quadratic silicon films ensure that used discs can be stored and reused. Suction channel with union for connecting extraction device for dust-free working. Each with 2 sanding discs of 80 grit, 150 grit and 240 grit. 220 - 240 V. 140 W. 50/60 Hz. Adjustable grinding speeds between approx. 250 - 800 m/min (corresponds to 1,150 - 3,600 rpm). Sanding disc Ø 125 mm. Table 98 x 140 mm. Sanding height 62.5 mm. Size 300 x 140 x 160 mm. Weight approx. 3 kg. With associated horizontal C-clamp (with table), but can also be fixed quickly and safely vertically (for sharpening tools). Self-adhesive Corundum Sanding Discs for TG 125/E. Industrial quality. For sanding soft and hard woods, laminates, non-ferrous metals, steel, plastics, cork, rubber and minerals. Ø 125 mm. One square silicone film for storage and reuse of used sanding discs is included. 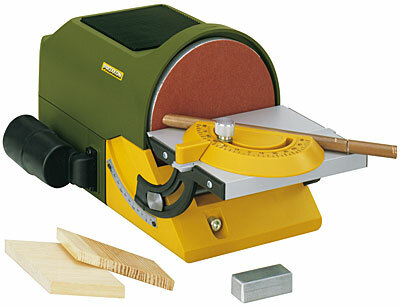 Click the button below to add the Proxxon Disc Sander TG 125/E to your wish list.